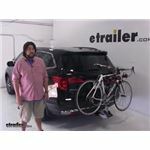 The Thule Hitching Post Pro 4-bike rack is a beast--very solid and sturdy and the bikes do not budge when racked into it on my 2013 Honda Pilot. Assembly was fast and installation made sense. The rack is heavy but was no problem for an athletic woman (presumably one that rides her bike) to install. However, I don't like leaving the rack on my Pilot when I'm not using it, so I wish it had an easier hitch latch with a lock-pin rather than a bolt that requires screwing in every time I want to hitch the rack. Other than that, its intuitive to use, the bikes fit securely with the included straps and stabilizers, and I have no worries that the rack or bikes will budge at all when driving. The rack can theoretically hold 4-bikes, but that seems crowded given the heavy frames of some of the bikes in my household. Overall, I give the Thule rack a very good rating for ease of attaching bikes, its sturdiness, and good price point. This is a great bike rack. It's quick to install or remove. While installed, it can be lowered to allow one to access the back compartment of your vehicle (in my case, a Honda Pilot). It holds our bikes easily and I appreciate the anti-sway mechanism to help keep the bikes steady. When not in use, we keep the accessories in a large ziplock bag in a compartment in the back of our SUV. There are attachments that you can purchase to ensure a stable fit on a variety of bikes, but we have been able to make due with the rack as it came. I definitely recommend this rack. One year later and its still a great bike rack! In looking for a bike rack for our 2009 Honda Pilot, I read a number of reviews and found this product to be most favorable. So far, it has met (and even exceeded) expectations. It was easy to assemble, and I am able to attach and remove it to our Pilot without assistance. The bikes stay very secure; we added an additional bungee and bike lock on a long trip as "back-up" and it worked perfectly. I love the option to tip the rack so that I can get into and out of the back of my Pilot without having to remove the rack altogether. In addition, the cost is difficult to beat. All in all, a great value for our family! We are still very much enjoying the bike trailer. It has been a great fit for our family. This rack is sturdy and secure. Easy to hook up and doesn't bounce around a lot. I have a Pilot hatchback and the tilt function is a life saver. I highly recommend the product. Works very well. We've made a couple of 1,000+ mile trips in some high winds with no problem. Initially figuring out how to mount the rack was a bit tricky, but the process isn't too hard once you work it out. The products delivered 6 days after the order, much earlier than I thought. The installation is smooth and the hitch fits perfectly to my Pilot 2006. 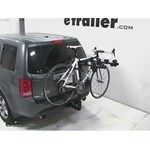 Love the Thule product-Rear Bike Rack Holder. Easy to engage the bike to the wheel well. Highly recommendable! After scrouring the local bike shops in my area and being told my vehicle could not support a trunk rack for three bikes I ran acrossed this rack when I googled trunk racks for my SUV. I have a 2007 Honda Pilot and I was looking at $600.00 for a roof rack or hitch mounted rack which was really more than I wanted to spend. When I checked online this rack came up as an option for my car! 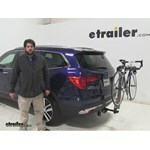 I called etrailer and the customer service was amazing and they were able to answer all of my questions . The rack shipped promptly and Installed it myself. This was my first rack ever so there was a little bit of a learni curve for me but overall it was SO easy to install and is now a breeze for me to take on and off . This is a quality sturdy rack. I love this rack and love the company ! Thank You!!! 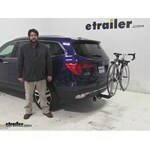 Etrailer for making the ONLY rated trunk rack for my car at 1/3 of the cost of a cumbersome roof rack or trunk hitch!!! Love IT!!!!! Great bike rack! I needed a rack that would fit over the spoiler on my 08 Honda Pilot. 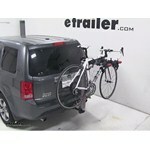 etrailer had the best price on this rack with an accurate description and quick shipping. Love this for the height as I am a 72 year old woman and lifting the bile can be a problem for me, but not with this rack I use on my Honda Pilot. I do use a bungee cord around the post while I am taking the bike off the rack as the bike will fall off once the holding bar is elevated so this prevents accidental damage to your car and bike. As our family has grown, so have our bikes. We needed an upgrade from our frame mount rack. The XTC4 was an easy decision based on the many product reviews and some careful research. First, shipping was amazing! I ordered it on a Monday, and it was at my door the next day. Assembly took about an hour. Setting up and adjusting for four bikes took about another hour to make sure all bikes would go on and off the same way each time. It fits our fleet of mountain bikes nearly perfectly. It also fits behind our 2012 Honda pilot with room to spare when folded upright. Great product, awesome shipping! I love my Swagman XTC4 4-Bike Rack. Very simple to put together. In less than an hour you are done. The quality and finish of the rack is superb. You can put different size bikes from children to adult without a problem. Bikes are secure, I have driven at highway speeds without any concern at all. I had a two pole hanging type bike rack before this one and the bikes were getting scratched and I was always concerned of them falling off. 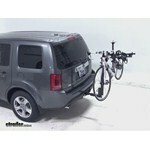 The swagman bike rack folds away nicely when not in use and it fits perfectly on my 2005 Honda pilot. You will not be disappointed. I highly recommend this product. The best Bike Rack I ever purchase. Disappointing to learn upon delivery that a top tube adapter is needed for bikes with sloping down tubes. 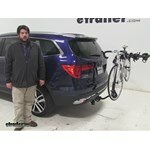 The Yakima bike rack is sturdy and exactly what I was looking for. The trailer hitch was easy to install and fit my vehicle perfectly. Also, the service I received while purchasing these items was outstanding! I strongly recommend etrailer.com to anyone looking for trailer accessories. I've owned this bike rack for about a year and been very pleased with its functionality. It is very stable and doesn't sway, even when fully loaded with bikes. It works very well for mens bikes but if you plan to used this for a woman's bike I would suggest purchasing some kind of cross bar to put on the bike so that you don't have to tilt it as much to put into the rack. Its nice to be able to tilt the rack down with the bikes still on it to access the back door hatch on the car. My older rack had to be unloaded to open the hatch. Very quality product! I had my local garage attach this rack while installing the tow hitch (#24882) compatible with my 2013 Chevy Cruze LTZ. I haven't taken it off yet (only 3 weeks since installed), so I cannot yet comment on ease to attach/remove. I see it's hex bolt connection, and wrench is provided. A "quick release" mechanism would be cool, but I think the bolt is better for anti-theft and to stabilize the rack in the hitch slot. Works extremely well with wife's and mine Schwinn bikes. Use the provided strap to minimize bike sway against the bumper on starts and stops. Though on my car, the distance from the bike to bumper is not very close. 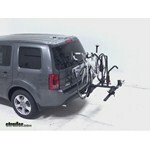 The product, Swagman XTC-2 bike carrier arrived on time as estimated. No scratch, no bent, no missing parts - all good. Installation process took about 30 minutes: some parts came pre-assembled. Our SUV has a 2" receiver, so we use the rack as delivered (assembled for 2" use). Already taken the bikes out for a ride: this easy, safe, and comfortable product made it a breeze. We love it and hope to use it for a long time. Pros: Well built. Ability to hinge in two places makes it easy to work around if you leave the rack on. Held bikes solid. Cons: Not a good fit for bikes with non standard frame size or angles. The rubber ties require the grip of at least a large Swedish masseuse to attach and remove. It can seem like a twisted game of Tetris to get your bikes on if your using all four slots. 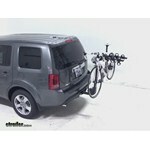 Good rack for hauling multiple bikes if they are standard size and frame structure. It worked great for the bikes that fit, recently sold to buy new one to accommodate unique framed bike. Bought this so my girlfriend could take her daughters riding on the rail trails a few miles away. It is heavy and requires a bolt to attach to receiver so I have to install it for them. They have no trouble loading/unloading although the first 2 bikes require two girls to load. They are unable to use the tilt down feature when it is loaded but use it all the time when empty. The bars are stored in the down position whenever unloaded. Good product although Heavy. Assembly of this rack was fairly straight forward. Instructions consisted mainly of illustrations. I had one issue during assembly where I overtightened bolts and fatigued plastic mating surfaces. The directions gave no caution or guidance regarding how tight to make things. I thought, tighter is always better (wrong). Kuat customer service was very helpful and shipped out replacement parts no questions asked. I am totally satisfied with the rack function, fit and ease of use. I have yet to take long trips but, in local use, it has performed admirably. I was also totally satisfied with etrailer's order fulfillment and customer support. Excellent product, better than I thought it would be. Easy assembly. Have used it numerous times with no problems. Stable ride with very little movement over bumps. Hi George! Love both products. Absolutely no problems and both holding up well in the weather. Very easy to use and makes bike transport simple and easy. Really well made and sturdy. Fitment website very helpful, especially the photos showing my exact vehicle. Used it for first time yesterday and worked great! Wish somewhere it had said, that if you have girls bicycles, you need bars for them. Everything else was great! Only used 2 bike carrier on a 2" hitch on a 16 pilot.ie, hitch and wiring from etrailer. No rattle, holds secure. 4 bike trip coming! Great value! This is the cheapest option for a 4-bike tray type carrier. Also, I like that it is actually three carriers - a 1.25" 2-bike carrier for my car, a 2" 2-bike carrier for my SUV, and a 2" 4-bike carrier for my SUV. I knocked off a star for three reasons: - The first item I received was defective(etrailer shipped me a new part). Quality control is lacking, but what do you expect at this price point. - The velcro straps are not durable at all. One broke after about a dozen uses. - It doesn't fold up out of the way when not in use. Again, at this price point you make some sacrifices. Overall, very pleased with the purchase considering that alternatives are 2 to 3 times the cost of this rack. After searching for a bike rack for my 2015 Hyundai Sonata, I settled on the Yakima Fullback 3. I initially wanted a roof rack so I could carry my bikes and kayaks, but my options with the panoramic sunroof were limited and expensive. Part of the Sonata trunk lid is plastic so I was very hesitant to use a trunk mounted rack. It seemed that most Sonata owners were using a trunk mount rack, so I placed my order on a Sunday evening. etrailer shipped it the next day and I received the rack on Thursday. It took about 10 minutes to unpack, read the instructions and install it. I put both my mtb and road bike on and went for a test ride. The rack was more stable than the hitch mounted rack I had on my old vehicle, and the best part was it didn't scratch my paint. It keeps the bike pedals far away from my bumper, and it was one of only a few racks that would clear my factory spoiler. It folds up and I can stick it in my trunk while I ride. The only reason for the 4 stars is that the rack is fairly heavy. It would be nice if Yakima could find a way to lighten it up while keeping the rigidity and price where it is now. 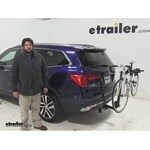 Otherwise, I'm completely satisfied with the rack and the service from etrailer. So I am someone who really likes to look at products and compare and compare some more, before I make a purchase. So, I really put some effort into finding the right product for our family. And I can say that this is one of those that hit a home run with us! This rack is incredibly easy to use and the fold flat ability for storage was the tipping point for the perfect rack for our family. The ease of use is incredible, I think that hardest part is holding the weight of it up while inserting into the trailer hitch hole and that's really not hard at all. You can load/unload bikes fast and easy, the rubber coated arms help keep your bikes from getting scratched. The quick click clamps work great and are adjustable on a slider to accommodate bikes of varying widths. Only thing I think that could use improvement with this is, I would like the integrated/included bike lock cable to be a bit longer and a little thicker but that's just nit picking. It's really a great bike rack that is extremely easy to use, install, remove, and store almost flat when not in use. This took a little bit of time to set up but once done, it carries well - little to no sway. I did under estimate the height once it was on my Expedition since I am only 5 foot tall! I can literally walk under it! Regardless I can easily lift onto and off of the rack. I don't leave it on my truck all the time and so having a second person to help reinstall it on the hitch is helpful but not a requirement. I can do it by myself. I am a 60 year old female in average shape. Highly recommend this carrier. In one word: AWESOME! Not only is the Yakima rack awesome, but the delivery was lightning fast and the purchase experience was easy! I bought the rack with the additional add-on and they were easy to install and use! Definitely recommend! Seems like a solid rack. Really heavy and bulky which I was not expecting. You essentially have to mount the 2 bike rack to the car then slip in the 2 bike add-on. Lifting the 4 bike rack as assembled is doable but triccky. Still much better for my beloved bikes than the 4 bike cradle racks which beat the bikes up as they rub each other. Warning: the nut in the receiver part of the rack had steel shot beads stuck in the grease so I couldn't thread the bolt in. I had to disassemble the nut holder and pick the steel beads out with a dental pick. Excellent quality rack. Had to reorder as my wife backed the original one in to a gas station pole. So ordered a new one and got the 2-bike extension as well. Heavy, sturdy, and high quality. The instructions are pictures only, no words. For the main rack they are okay, for the extension they are a bit fuzzy on removing the handle for transfer to the end of the extension. Essentially you unscrew the middle screw until it feels disengaged. You can't see since it's internal and the screw does not come out. Then removing the screws on the sides releases the handle. They try to picture how to position the screw before putting the handle on which is where it could use some words or better pictures. Basically it needs positioned to both clear the handle house and the tab in the handle where the center screw will attach to. So really trying to hid the screw as much as possible in the block that it's in. It makes sense once you have it apart. Rack is easy to insert and remove from the hitch but maybe a little awkward and heavy for some ladies. Love this rack! We love this bike rack! It is sturdy and roomy! The only downside is finding a place to store it when it is not on the car. it is awesome! 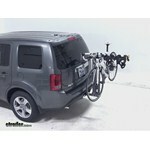 we love this bike rack, have taken it across country and up to the high country. I really feel our expensive bikes are completely safe on this rack. Bike rack is extremely sturdy. Comes assembled and took less than 5 minutes to install. Works and looks great on the pickup truck. Unit swings aside to allow bed to be fully accessed even with 4 bikes mounted. Lock into the trailer hitch prevents removal which was the main reason for purchase over competitive Thule unit which lacks such a locking mechanism. Very pleased with purchase. etrailer was a breeze to do business with. Unit arrived within 2 days. I did place order over phone, rather than internet. Was told that this would expedite shipping. One of the better product buys I've ever made. Solidly built! No problem hauling 4 bikes and the swing out feature makes it easy to access the bed of my pickup. Solid bike rack, bikes dont move when loaded. Fits 2010 rav4 (rav has aftermarket hitch which extends further than factory), the rack can be folded all the way up and barely touches spare. Folded all the way down with no bikes, I can open rear door all the way. Shipping was quick, price match was honored, rack quality excellent. My order was handled in a timely manner. I ordered the product one evening, the product was shipped the next morning, and the product was received the next day. The product ordered was a Thule bike carrier (I also ordered a trailer hitch the same evening and also received it the same day as the carrier). Both products were as advertised and fit my car and functioned properly. This was my first experience with etrailer and, if needed, would use them again. I am very satisfied. Today, on our 2017 Honda Pilot, we're taking a look at the Yakima Full-Back Trunk-Mount 2-Bike Rack, that part number is: Y02634. Now, we already have our bike secured down here, we're first going to show you how we secure it in place. On the end here, we do have a cable lock, this can be used to lock your bike onto your rack. It is going to lock this last bike, which will prevent anyone from being able to remove the first or the last bike. To remove our bikes and to secure them, we're going to push on our tabs and pull out our zip strips. They easily push into place, and they've got cushioning to prevent any scratches or abrasions from our straps onto our bike. We'll take that off. It's going to hold it in three points, two on the frame and one as an anti-sway cradle, as you saw before. Speaker 1: Today in our 2016 Honda Pilot we're gonna be test fitting the Yakima fold back two bike rack part number Y02634. We already have a bike installed on the rack so let's go ahead and take a closer look and show off some of the features. This is one of the more higher end hatch mount and bike racks that you're gonna see out there, starting at the ends here we're gonna have the patented Yakima bottle opener on one, and this comes with a lot of the Yakima bike racks. And on the other end we're gonna have the integrated cable lock.You would actually take it out, wrap it around the outer frame of the outer bike and attach it to this point here and lock it in place to secure your bikes in place once everything's done. Moving to the cradles, these are gonna be stationary meaning they don't move back and forth or side to side, however they do have this TPE padding at the base here and that's gonna act as kind of a shock absorber for your frame while you're traveling and help protect it. It's also gonna be padded along the bottom side of our zip strips here as well where it makes contact with your bike frame.It's gonna hold your bike at three points, we'll have two zip strips up at the top two here, one off to the side which is gonna serve as an anti-sway cradle to keep the bike from moving too far back and forth and causing bike to bike contact. Speaker 1: Today with our 2016 Honda Pilot, we're going to be test fitting the Yakima HalfBack 2 Bike Rack, part number Y02636. We already have a bike installed on our rack. Let's go ahead and take a closer look and show off some of the features. Starting at the end here, at the ends of both of our arms we're gonna have the Yakima bottle openers which are pretty common amongst most other bike racks. Moving back we have the cradles here. These are stationary, meaning they don't move back and forth or side to side but they do have this TPE padding at the base here, and that's gonna act as a shock absorber while you travel to help protect the frame of your bike. Today in our 2016 Honda Pilot, we've gonna be test-fitting the Swagman XC 2-Bike Rack for 1-1/4" and 2" Hitches, part number S64650. We already have a bike installed on the vehicle. Let's take a closer look, and show off some of the features. How the bike is held into place, we're gonna have one point of contact, which is gonna be this padded hookup at the top, and that's gonna keep it in place, while the tires rest in these wheel cradles here, which are adjustable along the length of the bike rack to accommodate loading and different sized bikes. So, you loosen and tighten these knobs to adjust them along the length of the arm here. Also, this does have a raised shank to it, so even with vehicles that has a particularly low hitch-clearance, it's not gonna have an issue of clearance between the bike rack and the ground. Let's go ahead and take the bike off and set it aside, we'll hold on to the bike while we release our hooks here, and that's just to make sure the bike doesn't fall onto the vehicle. There's this gray button here at the base of our frame-hook, push that in, and now we can grab the bike and set it off to the side. Today on our 2016 Honda Pilot, we're going to be test fitting the Malone Hanger 3 Bike Rack, for 1-1/4" and 2" hitches, part number MPG2127. We already have a bike installed on our rack, so let's go ahead and take a closer look and show off some of our features. At the ends of our arms we will have reflectors for better vision at night. The cradles all are adjustable along the arms here to accommodate loading and unloading, and can be tightened down with these blots here and an included tool. It grips your bike at two points. We're going to have a strap up at the top here and off to the side here. That's going to serve as an anti-sway cradle to keep your bike from moving too far back and forth, and making bike to bike contact. When all three bikes are loaded, it does come with two stabilization straps to put around the bikes as well. Today on our 2016 Honda Pilot we're doing a test fit of the Thule Vertex swinging and hanging-style 4-bike rack. That part number is TH9031XT. Now we already have our bike secured down. We're first going to show you the key feature of this rack. We're going to come here to the back of it. We're going to start by removing our t-pin. Today on this 2016 Honda Pilot we're going to be test fitting the Yakima Light Rider, Two Bike Rack. Part number Y02472. As you can see we already have a bike installed on the rack. Let's go ahead and take a closer look at it and show off some of the features. Now, how the bike is actually attached to the rack, we're going to have three points of contact with the bike's frame. We're going to have the two zip strips up top here, plus the one off to the side which is going to serve as an anti-sway strap, which will keep the bike from going back and forth possibly hitting the bike rack itself or the bikes in front of it. Let's go ahead and take that off and set the bike aside for now. Today on this 2016 Honda Pilot, we're going to be test fitting the Thule Roadway 2 Bike Rack, part number TH912XTR. As you can see, we already have a bike installed on the rack. Let's go ahead and take a closer look and show off some of the features. Now first how it actually attaches to the rack, it's going to have three points of contact. We're going to have two straps up top here to the frame and one off to the side here. That's going to be an anti-sway strap to keep the bike from moving back and forth, possibly hitting the bike itself or the bikes in front of it. Let's go ahead and take the bike off and set it aside. When you take the straps off, it's always a good habit to put them back into place because you don't want to lose them while you're driving. Today on this 2016 Honda Pilot we're going to be testing the Thule Vertex Four Bike Rack, part number TH9029XT. As you can see, we already have a bike installed on our rack. Let's go ahead and take a closer look and show off some of those features. First off, the bike actually attaches to the rack with three points of contact to your bike's frame. We're going to have two straps up top here and one strap off to the side, which is going to act as an anti-sway strap keeping it from moving back and forth, possibly hitting the bike rack or the bikes in front of it. Let's go ahead and take the bike off and set it aside. It's always a good habit when you remove the straps just to put them back into place. So in this 2016 Honda Pilot, we're going to be test-fitting the Swagman Trailhead 4-bike rack, part #S63380. As you can see, we already have a bike installed on the rack, so go ahead and take a closer look and show off some of the features. Now, how this bike is actually attached to the rack . you're going to have 4 points of contact with your bike's frame. We're going to have 3 straps, up top here, and one off to the side here, which is going to serve as an anti-sway strap to keep the bike from going back and forth, hitting possibly the bike rack itself, or the bikes in front of it. Let's go ahead and take the bike off and set it aside. When you remove the straps, it's always a good habit to put them back into place because you don't want them flapping around when you're driving, and more importantly, you don't want to lose them while you're driving. Today on this 2016 Honda Pilot, we're going to be test-fitting the ROLA TX-102 2 bike rack, part number 59400. As you can see, we already have a bike installed on the rack, let's go ahead and take a closer look and show off some of the features. Now how the bike actually attaches to the rack, you're going to have 3 points of contact with the bikes frame. We're going to have two straps on the top here, and one off to the side which is going to serve as an anti-sway strap which keeps the bike from going back and forth possibly hitting the bike rack or the bikes in front of it. Let's go ahead and take the bike off and set it aside. Now once you remove the straps it's always a good habit to put the straps back on, primarily cause you don't want to lose them while you're driving and you don't want them flapping around in the wind. Now with that done I'm going to go ahead and give you a couple measurements now. Today on this 2016 Honda Pilot we're going to be test fitting the Hollywood Racks Over the Top 2-Bike Rack, part number HRF2. As you can see, we already have a bike installed on the rack, let's go ahead and take a closer look and show off some of the features. How the bike is actually attached to the rack, we're going to have three points of contact with the bike's frame. We're going to have two straps up at the top here, and one underneath here which is going to serve as an anti-sway strap to keep the bike from hitting either the bike rack itself or the bikes in front of it. Let's go ahead and take the bike off and set it aside. Now when you release the straps it's always a good idea to put them back into place because you don't want them flapping around while you're driving, and more importantly you don't want to lose them while you're driving. With that done I'm going to go ahead and give you a quick measurement. This is going to be how much distance is added to the vehicle when the bike rack is installed. Today at our 2016 Honda pilot, we'll be doing a test fit of the Rhino-rack Mountain Trail Rooftop Bike Carrier Fork Mounting. Part number, RBC035. You see that we already have a bike mounted on our vehicle. We have it mounted to our rack. I'll show you a few features here. First we check and show where we have the forks into, there's a knob here with a lock, all we do is pop this, this way and lift up the bike to take it off. Right now we have it off. Today, in our 2016 Honda Pilot, we'll be doing a test fit of the Kuat Trio Roof Bike Rack fork mounting. Part number is TR02. You see we already have it on the vehicle. This is an aluminum and black polish chrome. It will look real nice on your vehicle. You see we have a bike already up there. I'll show you a few features. First feature that I'll show you is right here we have where we hold the fork ends. Today on this 2013 Honda Pilot Ill show you how to install and operate the Yakima Double Down Ace four bike carrier, part number y02451. To install slide the shank into the opening of the hitch tube and align the pin hole. Once the pin holes are aligned insert the red safety pin and turn the black knob located at the rear of the carrier to engage the anti-rattle device. Now lets go over some clearance measurements to see how the bike carrier and the vehicle fit together, theres about 18-1/2 inches of ground clearance, the closet part of the vehicle to the closet part of the carrier is about 7-1/2 inches, weve added about 14 inches to the overall length of the vehicle. To access the cargo area lift up on the red knob located at the base of the carrier and pull the mast towards you, this will allow you to gain access to the cargo door. To load the bike make sure the mast is in its upright position, pull the red latch located at the top of the mast and pull the cradle arms towards you and undo the cradle straps. Today on our 2013 Honda Pilot Ill be showing you how to install and operate the Thule Apex four bike carrier, part number th9025. To install the carrier slide the shank into the opening of the hitch tube and align the pin hole securing it with a spring loaded pin. Then tighten the black knob located at the base of the carrier to engage the anti-rattle device. Now lets go over some clearance measurements to see how the vehicle and the bike carrier fit together, there is about 19-1/2 inches of ground clearance, the closet part of the vehicle to the closet part of the carrier is about three inches, weve added about 13 inches to the overall length of the vehicle. To access the cargo area lift up the gray handle located at the base of the carrier and pull the carrier towards you, this will allow you to have access to your cargo door. To load the bike first make sure the mast is in its upright position, lift the gray handle at the top of the mast, pull the cradle arms towards you, and undo the cradle straps, set your bike on the frame cradles and secure it with the cradle straps, and that concludes todays test fit for the Thule Apex four bike carrier, part number th9025 on this 2013 Honda Pilot..
Today on our 2013 Honda Pilot, Ill be showing you to install and operate the Kuat Aluminum Hitch Bike Carrier, part number S102. To install the carrier, slide the shank into the opening of the hitch and align the pin hole, put the pin through the pin hole, lock and turn the black knob located at the base of the carrier to engage the anti-rattle device. Now lets go over some clearance measurements to see how the bike carrier and the vehicle fit together. There is about 19 inches of ground clearance. The closest part of the vehicle to the closest part of the carrier is about six inches. We have added about 16 inches to the overall length of the vehicle. Today on our 2013 Honda Pilot Ill be showing you how to install and operate the Yakima stickup two bike carrier, part number Y02420. To install the carrier slide the shank into the opening of the hitch tube and align the threaded pin hole. Thread the anti-rattle bolt through the threaded pin hole, tighten with a wrench and secure with a security pin. Now lets go over some clearance measurements to see how the vehicle and the bike carrier fit together. There is about 19 inches of ground clearance. The closest part of the vehicle tot eh closest part of the carrier is about 7 inches. Today on our 2013 Honda Pilot Ill be showing you how to install and operate the Thule vertex four bike carrier, part number TH9029. To install the carrier slide the shank into the opening of the hitch tube and align the threaded pin hole. Thread the anti-rattle bolt through the threaded pin hole and tighten with a wrench. Now lets go over some clearance measurements to see how the bike carrier and the vehicle fit together. There is about 18 inches of ground clearance. The closest part of the vehicle to the closest part of the carrier is about 5 inches. 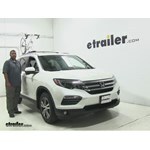 Today on this 2013 Honda Pilot Ill show you how to install and operate the Thule hitching post pro, part number TH934XTR. To install, slide the shank into the opening of the hitch tube and align the threaded pin hole. Thread the anti-rattle bolt through the threaded pin hole and tighten with a wrench. Now lets go over some clearance measurements to see how the bike carrier and the vehicle fit together. Theres about 18 1/2 inches of ground clearance. The closest part of the vehicle to the closest part of the carrier is about 9 1/2 inch. 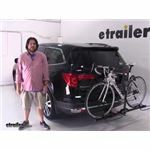 Today on this 2013 Honda Pilot Ill show you how to install and operate the Thule double track platform bike carrier, part number TH990XT. To install, slide the shank into the opening of the hitch tube and align the threaded pin hole. Thread the anti-rattle bolt through the threaded pin hole and tighten with a wrench. Now lets go over some clearance measurements to see how the bike carrier and the vehicle fit together. Theres about 19 inches of ground clearance. The closest part of the vehicle to the closest part of the carrier is about 7 inch. 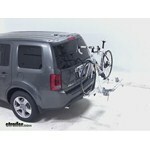 Today on our 2013 Honda Pilot Ill show you how to install and operate the Swagman titan four bike carrier, part number S63410. To install slide the shank into the opening of the hitch tube and align the threaded pin hole. Thread the anti-rattle bolt through the threaded pin hole and tighten with a wrench. Now lets go over some clearance measurements to see how the bike carrier and the vehicle fit together. Theres about 19 inches of ground clearance. The closest part of the vehicle to the closest part of the carrier is about 10 inch. Today on this 2013 Honda Pilot Ill be showing you how to install and operate the Softride Dura parallelogram tilting bike carrier, part number SR26247. To install slide the shank into the opening of the hitch tube and align the threaded pin hole. Thread the anti-rattle bolt through the threaded pin hole, tighten with a wrench, and secure it with a lock. Now lets go over some clearance measurements to see how the bike carrier and the vehicle fit together. Theres about 19 inches of ground clearance. The closest part of the vehicle to the closest part of the carrier is about 3 inch. 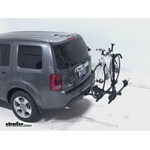 Today on our 2012 Honda Pilot, we'll be test fitting the Hollywood Racks Traveler four-bike carrier, part number hr8500. To begin our test fit, we'll slide the shank of the carrier into the opening of the hitch, line up our pin holes, slide our antirattle through the pin holes, and tighten with a wrench. Now with the carrier secured to the vehicle, we'll go over a few clearance measurements to see how the bike carrier and this vehicle will fit together. There is about 18 1/2 inches of ground clearance. The closest part of the carrier to the closest part of the vehicle here at the rear bumper is about seven inches. With the cradle arms folded down, we have added about 11 inches to the overall length of the vehicle. 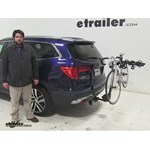 Today on our 2012 Honda Pilot, well be test fitting the Yakima DoubleDown Ace four bike carrier, part number y02451. To begin our test fit, well slide the shank of the carrier into the opening of the hitch, line up our pin holes, insert the pin with the red knob into the pin hole, and turn the black knob to engage our anti-rattle device. Now with the carrier secured to the vehicle, well go over a few clearance measurements to see how the bike carrier and this vehicle will fit together. Theres about 18-1/2 of ground clearance, the closet part of the carrier to the closet part of the vehicle here at the rear bumper is about eight inches, with the cradle arms folded down weve added about 13 to the overall length of the vehicle. Well now go ahead and pull the red lever at the top of the mast to swing the cradle arms out and well measure from the vehicles cargo door to the end of the carriers cradle arms and we get a measurement of 44. To access the cargo area, well lift up the red pin at the back of the carrier to tilt the mast down; this will allow us to have access to our cargo door. Yes, the cargo carrier portion of the Hollywood Racks Sport Rider SE2 Platform 2 Bike Rack w/ Cargo Carrier # HR1450Z-85 can be used as a stand-alone carrier. The cargo carrier can be installed directly into to a 2 inch trailer hitch receiver. Its weight capacity, which is listed as 100 pounds when used along with the bike rack, actually increases to 220 pounds when it is used by itself. I have attached a short video demonstration on this product that you can also check out. The wingnut is a thumbscrew that should have arrived already in the shank of the Curt 4 Bike Rack # C18030 and definitely not just falling out. It helps stabilize the rack and as you can see at about the 1:30 mark of the video I linked for you, is something you would need to unscrew a bit in order to allow the bike rack to tilt down. You can use the Hollywood Racks Over-the-Top 2 Bike Carrier # HRF2 and tow a cargo trailer as long as you have the clearance. You can use an extended length ball mount like # D-26 to give you extra clearance as well. I've linked the page to your options. For your bike rack, I recommend the Thule security strap # TH533 to secure your rack to your locked hatch and cable lock # CAB-10 to secure your bikes to the rack. 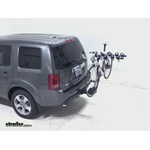 3 Bike Trunk Mounted Bike Rack for a 2016 Honda Pilot. Everyone that bought before me was right! I got my rack in time for my next days off and putting it together was fast too. And I'm a grandma!! Thank you for being fast and honest! You beat anyone in my town hands down!